Free music downloader is applications to download music free from sites that offer music either for free or otherwise. Are you a music lover? Do you love to listen to music in your free time or while doing any work? If yes, then you are on the right page as today I am going to share some of the best android apps from which you can easily download MP3 music among which you love to listen to. Downloading music or listening to them online is a way of life, most especially when internet users are common among the populace globally. In this article, I will put before you a list of Top free Music downloader for android and you can choose the best one. Every app has its own set of features and facilities to offers, you can go for the one which appeals to you the most. Downloading free music from free mp3 download sites seems to be a difficult process as UI of those sites are not much good, in some instances, the network might be the problem. Therefore, if you are interesting in downloading free music on your Android devices are the list of the best downloading apps. So to make free music downloading easy for you, here are the lists of top free music downloader apps. 4Shared is a free music downloader for many music lovers as it allows you to download and stream music online as well right on your android gadgets or phones. You can search, download and play your favourite musics by using this free android app. You can as well create playlists containing your favourite music and manage them with ease. While listening to any song if you wish to download it then you can simply tap and hold for few seconds on the song title and you will be provided with the option to download. You can also upload and stream your favorite songs on 4Shared as the app also provides 15GB of free storage to upload songs. This is another top free music downloader for android. It allows you to go through the millions of songs available on the app and also let you download them for free. With the help of this application, you can as well search the search engines and with its advanced options, you can download more than two songs at the same time. iTube Music is one of the top free music downloader from Play Store with an average user rating of 4.3. iTube is both music streaming and free music download app. You can find your favourite music track by finding it through Genres or simply just be searching it. Though, this app is available for Android phones having at least 4.1 Android version. I am damn sure that you can easily find most of your favourite mp3 tracks easily on this app, so that you can download your favourite music for free. Another app that is listed here among the top free music downloader is Advance download manager. This is a download manager app which allows you to organize and download files simultaneously on your device without limiting speed, depending on the strength of the network you are using at this is time. Fortunately, in this app browser lets users search for mp3 and mp4 files on the internet. Google Play Music is an increasingly popular option thanks to its accessibility and the ability to upload up to 50,000 of your own songs to the cloud for easy listening. Of the apps on this list, this is one of the best options if you want to combine your current collection with an online service. The free version of Play Music lets you stream your music and listen to various crated playlists. If you get All Access, you will also get YouTube Red, on-demand playback, and more. The service also now includes podcasts for both free and paid users. You will have no doubt how this app is among the top free music downloader Apps for Your Android Phone. Another app I will not underestimate in this list of free music downloader for Your Android Phone is Music Download Paradise. 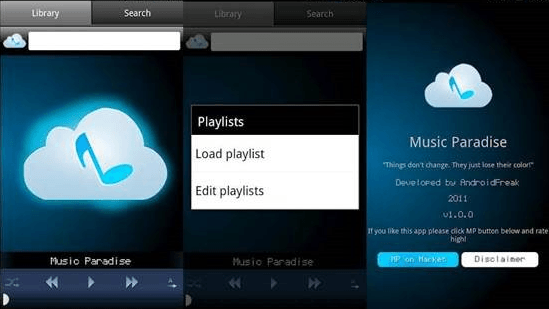 Music Download Paradise Mp3 is one of those high rating music download android apps in play store which allows you to download songs from its millions of collections for free. This app has a user interface that is easy to handle, sweet and simple. You can search and listen to copy left music and MP3 songs. GTunes music is one of the top free music downloaders for android and with its basic interface, easy searching and downloading options. Millions of songs, and music on public domains, this app is good to go, just give it a Trier and you will not regret. An additional feature for this application is it allows you to create your own ringtone for assigning it to any contact on your phonebook. This is indeed, GTunes Music is one of the top free mp3 downloader apps which shall always let you choose from the best of the best. As the name suggests, RockMyRun is a music app which is specially designed for joggers, runners and Gym freaks. It allows you to cache or download your favourite music for offline playback. It uses the myBeat technology that can change the energy level of the music mixes to make it tune with your body. It has a huge collection of DJ mixed music and you can easily explore and download your favourite ones for free. You can also share your favourite music track by using this music app. It is found among the top free music downloader for your android phone. Skull MP3 Music Downloader Pro is one of the best free app to download free music. Basically, this app has a search engine which will search for your favourites music according to your search query. It also has default music player from which you can listen to the downloaded music directly without opening stock music player. You can also set any music track as your ringtone by using their Set as Ringtone feature. I hope this app will not put you down. But according to user reviews, this app is quite slow. So, you have to be a little bit patient to download free music from this android app. The last but not the least on the list of the top free music downloader apps for your android phone is Gaana. This again is one of the best android mp3 downloaders with its collection of 10 million songs. Here, you can explore from the already created playlists which are based on a specific genre and you can as well create your own depending upon your choice. The app has songs in both English as well as Hindi and also any other Indian regional language, for free! Download Gaana app.We all know how much this apps ad had trended in the recent past; it surely was worth all the attention. Now that was about the list of list of the top free music downloader for your android phone. There is so much to choose from and so much to explore, but well, the best remains the best. Also, at the end of it all, it pretty much depends on the kind of need you have and the features that you must use. Thank you for the list of music apps, it’s extremely helpful!